In this example, the PLOT statement uses a plot request of the type y-variable*x-variable to plot the variable HIGH against the variable YEAR to show the annual highs of the Dow Jones Industrial Average over several decades. Create the data set. 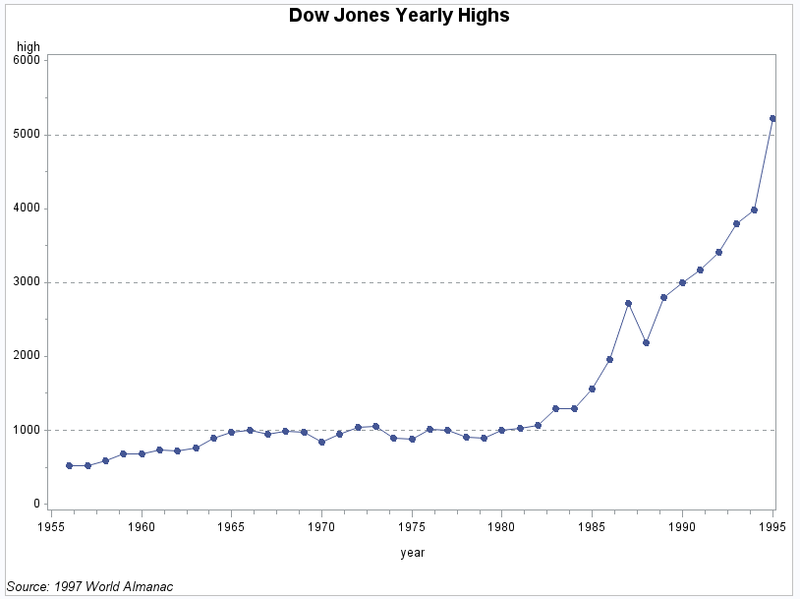 STOCKS contains yearly highs and lows for the Dow Jones Industrial Average and the dates of the high and low values each year. Define symbol characteristics. Specifying INTERPOL=JOIN joins the data points with straight lines and the VALUE= option specifies the type of symbol used. Generate the plot and modify the axis values. The VAXIS= option sets major tick marks for the vertical axis. The HMINOR= and VMINOR= options specify the number of tick marks between major tick marks. Add reference lines. The VREF= option draws reference lines on the vertical axis at three marks. TheLVREF= option specifies the line style (dashed) for the lines.